Fifteen teams will compete Saturday for best beer/barbecue pairing. The real winner: You. OLD IRVING PARK — Beer and barbecue go together like, well, beer and barbecue. But what's the ultimate smoked meat and brew combo? Fifteen teams of brewers and pit masters will battle Saturday for the title of Best BBQ/Beer Pairing at the Old Irving Park Beer & BBQ Challenge, which benefits St. Viator's. Last year's champ, the team of DryHop/Inglorious Basters, will be back to defend their crown. The real winner has already been declared: Anyone who buys a ticket and gets to sample eats like pulled pork pizza and drinks from local craft breweries Haymarket, Solemn Oath, Breakroom, Begyle, Revolution, Alarmist, Moody Tongue and more. General admission tickets are $50 in advance or $60 at the door. The price includes a barbecue sample from each team and two beers from each brewery. VIP admission, $75 in advance or $80 at the door, gives ticketholders all of the above plus early entry at noon for an extra hour of eating and drinking. 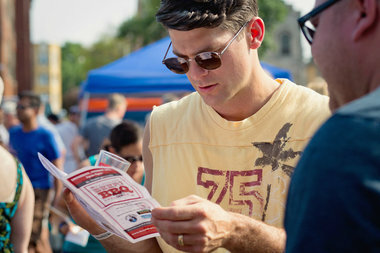 Celebrity judges will add their two cents for best barbecue. The panel is stacked with experts including Barry Sorkin of Smoque, Joaquin Soler of Smalls and Charlie McKenna from Lillie's Q.